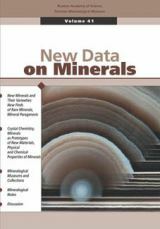 New Data on Minerals, volume 41, 2006. 184 pages, 121 color and 64 b/w drawimgs, schemes, photos, soft cover. Editor: Margarita I. Novgorodova, Doctor in Science, Professor. Publication of Fersman Mineralogical Museum of Russian Academy of Science. The volume 41 contains a description of new mineral species: Sokolovaite, Malyshevite and atencioite, a new representative of roscerite group; new data on Roxbyte from contemporary ore-bearing sediments of the Logachev-1 hydrothermal field (Mid. Atlantic Ocean); results of investigations of nicel, cobalt, iron sulfoarsenides and sulfoantimonides and krutovite from metamorphic-hydrothermal carbonate veins of the Norilsk ore field; new data on mineralogy of pegmatite and hydrothermalites of the kovdor phlogopite deposits and mineralogy and genesis of the Novo-Karkodinskoye demandoid deposit (Middle Urals), gold nuggets from Southern Verkhoyania (Yana Upstream region); goetite and lizardite paragenesis is described as typical formation of metakimberlites and hosted xenoliths; structural and genetic relationship of djerfisherite and bartonite; results of investigation of chemical structure of coconinoite and related alumino-uranul phosphates. In " Mineral Museums and collections" section a historical review on the Fersman Museum activity during the period of the World War II is published together with the description of the last Emperial Easher Egg from Faberge and a review of new specimens in the Fersman Mineralogical Museum collection. A section "Mineralogical notes" contains popular article on agate genesis, story about beryls on post stamps, and a mineralogical fairy tale "Species and varieties". 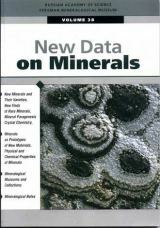 New Data on Minerals. Moscow. : Ocean Pictures, 2005. volume 40, 168 pages, 15 color and 99 b/w drawings, schemes, photos. The volume 40 includes articles on new mineral species, among which chukhrovite-(Nd), tsepinite-Sr, senkevichite, and kyrgyzstanite are described. The new data on rare minerals — calcurmolite and turanite, easily oxidizable chalcopyrite from black smokers of the Rainbow hydrothermal field (Mid-Atlantic Ridge), vanadium hematite associated with minerals of precious metals, copper, zinc, and iron is given; also there is data on fahlores from the Kvartsitovye Gorki deposit and the nickeline-breithauptite mineral series from the Norilsk ore field. Features of bismuth mineralization of the Djimidon deposit (North Osetia) and rare-metal mineralization connected with bituminous matters from pegmatites of the Khibiny and Lovozero massifs are revealed. The results of study of metacolloidal gold and delhayelite crystals are published. In the «Mineralogical Museums and collections» part, the minerals named in honour of collaborators of the Fersman Mineralogical Museum, specimens of platinum of the Ugolnyi stream (Norilsk) from the Museum collection are described; interesting historical data on the items of Decorative and Precious Stones collection (PDK) is given. «Mineralogical Notes» include the mineralogical summary of main mineral types of ores of Europe and the article devoted to mineral drawings of V. Slyotov and V. Makarenko. In new «Discussions» part, the polemics on the theme «What are the mineral and mineral species» is opened. The review of new books is published. The volume is of interest for mineralogists, geochemists, geologists, collaborators of natural-historical museums, collectors and amateur of minerals. 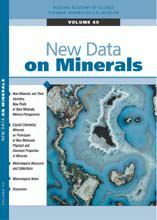 New Data on Minerals. Moscow. : Ocean Pictures, 2004. volume 39, 172 pages, 92 color images. Editor-in-Chief Margarita I. Novgorodova. Publication of Fersman Mineralogical Museum, Russian Academy of Science. Articles of the volume give a new data on komarovite series minerals, jarandolite, kalsilite from Khibiny massif, presents a description of a new occurrence of nikelalumite, followed by articles on gemnetic mineralogy of lamprophyllite - barytolamprophyllite series minerals from Iuja-Vrite-malignite complex of burbankite group and mineral composition of rare-metal-uranium, berrillium with emerald deposits in Kuu granite massif of Central Kazakhstan. Another group of article dwells on crystal chemistry and chemical properties of minerals: stacking disorder of zinc sulfide crystals from Black Smoker chimneys, silver forms in galena from Dalnegorsk, tetragonal Cu21S in recent hydrothermal ores of Mid-Atlantic Ridge, ontogeny of spiral-split pyrite crystals from Kursk magnetic Anomaly. Museum collection section of the volume consist of articles devoted to Faberge lapidary and nephrite caved sculptures from Fersman Mineralogical Museum. The volume is of interest for mineralogists, geochemists, geologists, and to museum curators, collectors and amateurs of minerals. 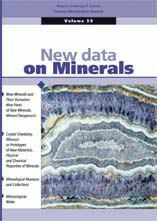 New Data on Minerals. Moscow. : Ocean Pictures, 2003. volume 38, 172 pages, 66 color photos. Articles of the volume are devoted to mineralogy, including descriptions of new mineral species (telyushenkoite – a new caesium mineral of the leifite group, neskevaaraite-Fe – a new mineral of the labuntsovite group) and new finds of minerals (pabstite from the moraine of the Dara-i-Pioz glacier, Tadjikistan, germanocolusite from Kipushi, Katanga, minerals of the hilairite group from Khibiny and Lovozero massifs). Results of study of mineral associations in gold-sulfidetellyride ore of the Kairagach deposit, Uzbekistan are presented. Features of rare germanite structure are revealed. The cavitation model is proposed for the formation of mineral microspherulas. Problems of isomorphism in the stannite family minerals and additivity of optical properties in minerals of the humite series are considered. The section Mineralogical Museums and Collections includes articles devoted to the description and history of Museum collections (article of the Kolyvan grinding factory, P.A.Kochubey's collection, new acquisitions) and the geographical location of mineral type localities is discussed in this section. The section Mineralogical Notes includes the article about photographing minerals and Reminiscences of the veteran research worker of the Fersman Mineralogical Museum, Doctor in Science M.D. Dorfman about meetings with known mineralogists and geochemists – N.A. Smoltaninov, P.P. Pilipenko, Yu.A. Bilibin.